Grand Residences Riviera Cancun is an exclusive hideaway on a spectacular white sand beach, a short stroll south of the picturesque fishing village of Puerto Morelos in the Mexican Caribbean. In a lovely natural setting, it is the perfect spot for an unforgettable vacation with world-class resort services. Enjoy the finer things in life and every luxury in your spacious suite, some of which have access to a private pool, garden, or roof terrace. The four-bedroom penthouse suite has a secluded terrace with a pool, whirlpool tub, grill, and bar. While the children have fun and make new friends and are kept active at the Kids or Teens Clubs, parents relax and enjoy each other in a romantic and peaceful environment. The property has a diverse collection of restaurants and bars, fitness and leisure facilities, and amenities such as in-suite check-in and private chef or butler services, all in the name of unforgettable and unique experiences. Just 20 minutes away, the Cancun Maya Museum lies next to an archaeological site and provides an overview of the ancient culture. Cancun Underwater Museum (MUSA) is the largest underwater art museum in the world, with over 450 life-size sculptures. Here one will find everything from perfumes and cosmetics to designer clothing and accessories, luxury watches and very exclusive jewelry, all duty-free! 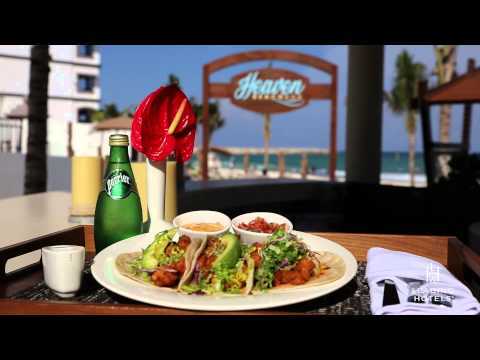 The closest one is in Cancun at Kukulcán Plaza, only 20 minutes away from Puerto Morelos. Along the “Malecon” or beachfront boardwalk in the town center. Watch the sunrise and the waves break on the reef, see the fishermen unload their catch or wait by the old lighthouse at sunset and watch as swallows arrive to roost in the building. You will find traditional and contemporary designs from the country's leading artisans in Cancun and Playa del Carmen stores. Look for the sterling silver .925 hallmark. A 20-minute drive south of Puerto Morelos is Playa del Carmen and famous “Quinta Avenida” (5th Avenue). This lively street is lined with jewelry stores, craft shops, galleries and more! Or head north to Cancún where Luxury Avenue in Kukulcán Plaza and Fashion Harbor in La Isla await. Plan a snorkeling or dive trip to the second largest barrier reef in the world where you will find colorful fish of all shapes and sizes, rays, octopus and even sea turtles. An adventure park in the jungle where one can try their hand at zip lining, swimming in cenotes, horseback riding and other activities. Mexico’s famous eco-archaeological park just 30 minutes south of Puerto Morelos! Highlights include regional wildlife, Mayan ruins, an aquarium and craft museum, snorkeling and underground rivers. Stay on for the evening show, a celebration of Mexican culture. Located on the Ruta de los Cenotes, a highway through the jungle inland from Puerto Morelos, this experience gives you the chance to visit four spectacular cenotes or sinkholes in one day and try your hand at zip-lining, snorkeling and rappel. オーナー 情報: Desarraollos Riviera Morelos, S.A. de C.V.